Sit upright and closer to the steering wheel than usual. Adjust the steering wheel to a position comfortable for you to drive. Start off slowly by applying the accelerator pedal gently. Use snow tires or tire chains. Keep sufficient distance between your vehicle and the vehicle in front of you. Use engine braking during deceleration. Avoid speeding, rapid acceleration, sudden brake applications, and sharp turns to prevent skids. Maintain slow and constant speed. Use tire chains driving in mud if necessary. Reduce vehicle speed and always check the road condition. Avoid speeding, rapid acceleration, sudden brake applications, and sharp turns to prevent getting stuck. When the vehicle is stuck in snow, sand or mud, place a nonslip material under the drive wheels to provide traction OR Slowly spin the wheels in forward and reverse directions which causes a rocking motion that may free the vehicle. However, avoid running the engine continuously at high rpm, doing so may damage the AWD system. 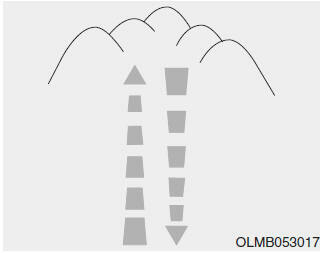 Driving uphill Before starting off, check if it is possible to drive uphill. Drive as straight as possible. Driving downhill Do not change gear while driving downhill. Select gear before driving downhill. Drive slowly using engine braking while driving downhill. Drive straight as possible. Exercise extreme caution driving up or down steep hills. The vehicle may flip depending on the grade, terrain and water / mud conditions. 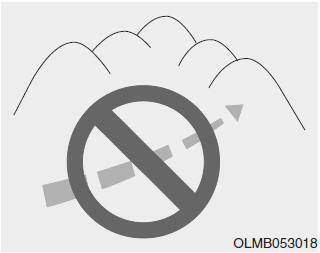 Do not drive across the contour of steep hills. A slight change in the wheel angle can destabilize the vehicle, or a stable vehicle may lose stability if the vehicle stops its forward motion. Your vehicle may roll over and lead to a serious injury or death. Try to avoid driving in deep standing water. It may stall your engine and clog your exhaust pipes. If you need to drive in water, stop your vehicle, set the vehicle in AWD LOCK mode and drive under 5mph (8 km/h). Do not change gear while driving in water. Always drive slowly in water. If you drive too fast, water may get into the engine compartment and wet the ignition system causing your vehicle to suddenly stop. Become familiar with the off-road conditions before driving. Always pay attention when driving off-road and avoid dangerous areas. Drive slowly when driving in heavy wind. Reduce vehicle speed when cornering. The center of gravity of AWD vehicles is higher than conventional 2WD vehicles, making them more likely to roll over when you rapidly turn corners. 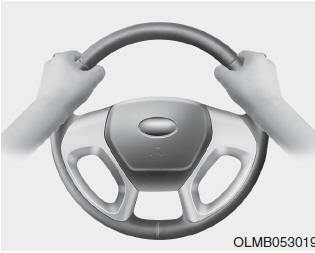 Always hold the steering wheel firmly when you are driving offroad. Do not grab the inside of the steering wheel when you are driving off-road. You may hurt your arm by a sudden steering maneuver or from steering wheel rebound due to an impact with objects on the ground.You could lose control of the steering wheel that may lead to serious injury or death.